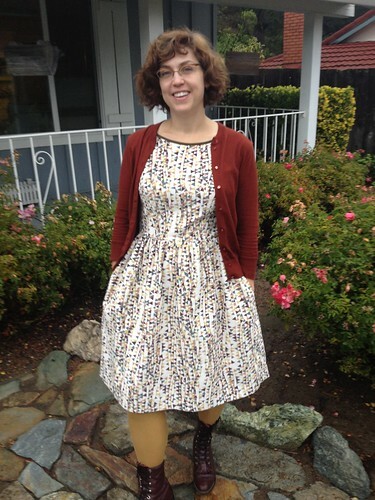 I nearly wore gold tights today (with my new Lauren Conrad for Kohl’s dress) – but I decided on no hose. I’m in Ohio and I’m a little cold. I am so impressed by your dedication to the 9929! And I can’t wait to see what Erin’s Go-To Pattern of 2013 will be. lovely dress! i like light colors in the darker time of the year. and in dresses for this time i sew a taffeta lining in the skirts. here it´s since oktober to cold for only knee socks. What a fantastic print! Love how you’ve found A Dress for All Seasons–looking forward to the wool version. I love sleeveless dresses in the winter, not sure why because we just got hit with the perfect storm sandy. Not as bad as NY and NJ but the temp did drop. I love your look! enjoy your bike rides! Perfect. A good pattern in a suitable style for the wearer and her lifestyle is the greatest sewing find! It should be adaptable for many occasions and through all the seasons. I think you have found yours. You look terrific in it! Delurking to recommend honest-to-God silk slips to stop your tights hanging up on your skirt. Ah, I was pawing the babycord in Liberty (yes, in Regent Street, London) but two days ago. I didn’t buy any, though it was so extraordinarily soft that it created a kind of textile illusion for me that I wasn’t touching anything at all. Does that make sense…? Enjoy your untouchable and very cute dress!